Today I was setting up an IC-7200 and while attatching the ground wire, I must have cross threaded it and twisted it til the screw snapped off. My question is can I just use the foot or strap attatch points for my Ground wire? On my IC-7200 I just backed off 1 of the 2 screws holding the SO-239 (ant. connector) and slipped in a spade connector, re tightened and attached alligator ground wire clip to the tubular part of the spade connector that sticks out. A more high level question might be "why are you attaching a ground wire to the rig?" The chassis should be connected to "green wire ground" for safety (assuming this is inside your house). This is a 12VDC rig, and most of them have the negative power supply common with the chassis, and many 12V power supplies have the negative common with the PS chassis which in turn is grounded to the electrical system third pin. That would take care of the safety hazard. A belt and suspenders "run a wire from chassis to electrical system ground" is fine, though. You don't need a ground wire to the rig for RF reasons, and it might actually make things worse. Presumably you have coax for the antenna? And the coax shield is grounded (outside) where it comes into the house. That takes care of the "power line falling on the antenna" kind of problem (and to a lesser extent, the "lightning striking nearby" problem). If you run a separate wire from rig to some sort of ground rod or other scheme, as an RF ground, you run the risk of the rig being part of your antenna system. You want all the RF to be "inside the coax". A more high level question might be "why are you attaching a ground wire to the rig?" He was probably doing something very few people do any more these days... he probably read it in the owners manual! The manual leaves out quite a bit of essential detail in that whole "bonding to ground" thing. 1) Yes, the chassis needs to be grounded, to prevent electrical shock (and the shock they mean is when something with high voltage touches the antenna, a fair number of people die every year from this cause). The greenwire ground is perfect and appropriate for this. 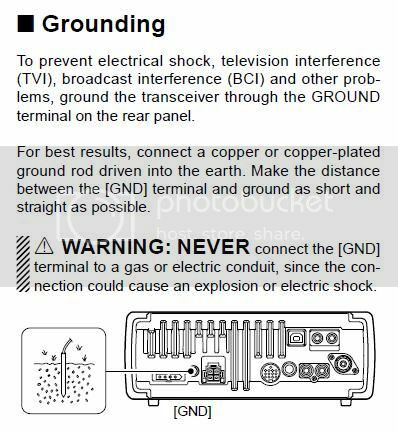 2) grounding the chassis as indicated (with a rod by itself) neither meets the electrical code (unless that rod is bonded to the building's grounding system), nor does it likely reduce interference. http://www.audiosystemsgroup.com/RFI-Ham.pdf has an excellent description of where a lot of RFI problems come from with respect to grounding, pin-1 problems, etc. Whether the chassis of the rig is grounded isn't typically one of them. In a well designed and installed system, connecting or disconnecting the ground wire to the chassis should make no difference: it's there for safety, and it shouldn't be carrying any current, DC, Line, or RF. One thing you don't want to do, however, is to ground your rig to the station ground and the electrical system ground. If the ground rods aren't connected (bonded) together, any differential would go right through your equipment (and possibly shock you if you're working your station. If they are bonded together and you connect the rig to the electrical ground, you'll create a ground loop--and all the problems that goes with that situation. He's totally correct I Just wanted to emphasis the "aren't" for those who may be speed reading the posts. In a proper setup everything is grounded together, that way if a surge comes in everything rises and falls together. It's just like when lightning strikes an airplane, nothing happens because the whole thing rises to the same potential and drops back down. If you have separate grounds one will have a higher voltage than the other and if anything is caught between the two grounds it gets zapped. Exactly. In a 'proper' setup, however, the station ground and the electrical ground are never connected together in the station area itself. If a fault develops in the house electrical system, current may well flow through that station 'connection'. That is the 'why' that is behind the NEC requirement to bond all ground rods/points serving a building together. On the other hand, if the connections between ground rods should be broken--or even weakened (corroded)-- the connection between the station ground and the house electrical ground in the station could well become energized, and that could well be to lethal levels. That is why a monthly check (at least) of all ground connections should be done. Have you ever checked the statement "...most of them have the negative power supply common with the chassis, ..." with an ohmmeter? I would bet many more than 'most' do not have the negative lead common with the chassis of the power supply. I recently had a brand new Pyramid supply where a solder short between the unregulated +24VDC and the chassis fried several things. Long story, but think now your entire household has 24VDC at 20+ Amps DC between the outlet safety (ground) wire and the negative terminal of that power supply. As well as anything plugged into the house mains with a 3-wire plug. Infact, none of the 5, 12VDC power supplies in my station have the negative terminal common with the safety (ground) wire when isolated from other devices. Besides, there is a reason for connecting your rigs metal case to ground for a lightning protection reason. A nearby lightning strike can cause induced voltages on the case. If it needs to seek ground through other devices or components, guess what is gonna fry. Same with a static discharge from walking across the room. Besides, it's cheap insurance if I'm right. And it won't cause harm if I'm wrong.